List of scorers: Mahatma Osumanu Otoo 3, Uriah Asante 1, Prince Attakora Gyimah 1, Douglas Nkrumah 1, Joseph Tagoe 1. * It’s not difficult to detect the problem at Hearts of Oak SC. Star striker Mahatma Osumanu Otoo (born 06.02.1992) is simply too alone up front and a new striker will most likely be brought to the club in January. On the positive note, Godwin Osei Bonsu (born 03.03.1989) is born again in central defence, youngster Thomas Arnold Abbey has been a revelation at left-midfield, and Abubakar Moro (born 07.08.1991) is about to become the midfield general Hearts of Oak SC desperately needs. The club has been unlucky with injury and key players like Uriah Asante (born 06.03.1992) and captain Esme Mends (born 25.04.1979) has been sorely missed in several matches. The picture is of Godwin Osei Bonsu and is taken from Ghanasoccernet. List of scorers: James Kwame Abban 3, Michael Helegbe 3, Daniel Agyei 2, Zuberu Fuseini 2, Yusif Ayoma 1, Fode Moussa Sylla 1. * Liberty uses a rotation-system which seems very positive for the many talents at the club. However, to make this system functional, a few key players are needed. Playmaker Michael Helegbe (born 15.09.1985) is still fundamental, hard-working box-to-box midfielder Issah Yakubu is very important and Kingsley Nteng is about to have a breakthrough as central defender / defensive midfielder. James Kwame Abban (born 31.07.1988), the powerful, energetic striker, has found his old self and looks dangerous up front. Some of the youngsters that have impressed me include utility player Kennedy Ashia (born 13.12.1994), right-back Yusif Ayoma, attacker Zuberu Fuseini and lanky midfielder Isaac Sackey. List of scorers: Louis Agyemang 6, Francis Coffie 3, Nana Yaw Afriyie 2, Jacob Asiedu Appau 2, Kwabena Adusei 1, Hans Coffie 1, Sampson Cudjoe 1, Augustine Sefa 1. * On paper, Medeama SC has one of the best teams in the league. However, things have not been working properly for the ambitious side. Perhaps too many new players have been incorporated into the team at once? Defender Osei Berko (born 13.02.1989), left-winger Francis Coffie (born 16.08.1988), defensive midfielder Sampson Cudjoe (born 22.06.1988), central defender Godfred Rockson (born 20.10.1986), midfielder Atia Sumaila (born 20.06.1985) and defender Nana Yaw Afriyie (born 08.11.1992) are all new players that have been playing regularly this season. Afriyie, a right-back or central defender, loves to join the attack and has been brilliant since joining Medeama SC from AshantiGold SC. Experienced centre-forward Louis Agyemang (born 04.04.1983) is still very important to the attacking play of the team and youngster Jacob Asiedu Appau (born 12.10.1994) is pulling the strings in midfield. Appau is arguably the most interesting prospect in the league and I don’t expect him to stay for long in Ghana. I expect wingers Francis Coffie (born 16.08.1988) and Richard Mpong (born 04.07.1990) to cause a lot more havoc for the second part of the season. The big disappointment of the season has to be the goalkeeper Stephen Ahorlu (born 05.09.1988). 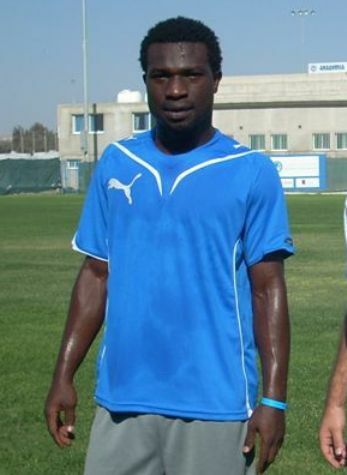 Ahorlu, a former member of the Ghana national football team, played professionally for Hapoel Ashkelon(Israel) in 2010-2011 but has not been able to take the number one shirt from Mozart Adjetey. * From my point of view, the most interesting player at Jets is striker Abubakar Sidi Soufian, formerly of the Ghana U-20 national football team. Soufian is a burly centre-forward who works hard and always looks dangerous. Kofi Owusu (born 07.04.1990) also has the potential to become a top marksman at this level. Mighty Jets FC has several youngsters and several new players and the blend has not been very functional so far this season. Some of their more experienced players are captain Wilfred Dormon (born 06.05.1986), a midfielder / right-winger and central defenders Daniel Coleman (born 01.10.1984) and Hassan Mohammed. Left-winger Tamimu Muntari and goalkeeper Issahaku Shaibu (born 02.12.1987) has been performing well this season. List of scorers: Emmanuel Baffour 11, Asiedu Attobrah 1, Ibrahim Moro 1. * It’s all been about star striker Emmanuel Baffour (born 02.04.1989) at New Edubiase United FC. Baffour has simply been outstanding. His 11 goals in 12 matches made him catch the eye of Goran Stevanovic, the head coach of the Ghana national football team, and Baffour will sensationally feature for Ghana at the 2012 African Cup of Nations. Baffour is an intelligent striker, a lethal finisher and a hard-working, disciplined player who should be able to win a contract at a good European club after the championship. Central midfielder and captain Abubakari Mumuni (born 17.05.1993) should not be forgotten. Mumuni is still one of the hottest players in the GLO Premier League. I’m also a big fan of Asiedu Attobrah, a right-winger / attacking midfielder. List of scorers: Bernard Akuffo 3, Daniel Appiah 3, Abdulai Hamza 3, Bernjamin Terry 2, Francis Narh 1, Nicholas Odjer 1, Kenneth Owusu 1. * Captain Bernard Akuffo (born 20.12.1986) has been impressive so far this season, forming a brilliant midfield with Derrick Mensah, youngster Moses Odjer and right-winger Francis Narh. I believe these four players will be the key to the success of Tema Youth FC. Playmaker Abdulai Hamza (born 30.11.1987) and striker Daniel Appiah will have to chip in with more goals, although the latter has made a positive impression. List of scorers: Frank Sarfo Gyamfi 4, Samuel Azumah 3, Godfred Kwame Gyasi 2, Saeed Adinan 1, Samuel Boateng 1, Eric Mensah 1, Joshua Otoo 1, Alex Tawiah 1. * You have to work hard to find a faster player in the GLO Premier League then right-winger Frank Sarfo Gyamfi. The youngster is arguably the hottest prospect at the club. Other key players are goalkeeper Robert Dabuo (born 10.11.1990), full-backs Livingstone Logoh (born 08.08.1987) and Joshua Otoo, as well as the in-form playmaker Seidu Salifu (born 02.08.1990). List of scorers: Abubakar Mahadi 2, Paul Danso 1, Ekow Ghansah 1, Razak Kassim 1, Richard Mensah 1, Jordan Owusu Mintah 1, Issah Salihu 1, Yufa Zugah 1. * The struggling Wassaman United FC has actually used almost 40 players in 12 matches so far this season. This must be very frustrating for the key players at the team, making it almost impossible to establish a good understanding with their teammates. A high percentage of the 40 are experienced, well-known players, including Prince Antwi (born 17.06.1986), Abdul Bashiru (born 17.04.1992), Kweku Essien (born 12.12.1984), Emmanuel Eyison (born 02.07.1989), Ekow Ghansah (born 27.01.1983), Issah Salihu (born 28.09.1983) and Yufa Zugah (born 01.08.1989). All players have several seasons in the GLO Premier League on their CV’s, but none of them has caught any headlines so far. To be fair, some of the newcomers seem to be smart signings, including striker Joseph Mugri from Aduana Stars FC and Razak Kassim from Berekum Chelsea FC, both up and coming players. Tricky winger Bashiru should also be able to raise his game for the second part of the season. There are not many survivors left from the team that won promotion to the GLO Premier League. Midfielder Jordan Owusu Mintah (born 02.10.1993) and striker Abubakar Mahadi (born 30.03.1985) are still key players. Defender Kwaku Boamah (born 15.09.1992) is one of few players that have caught my eye this season. For some reason, he is referred to as “Daniel Boamah” at most sources. From my point of view, Wassaman United FC has made the classic error several newly promoted clubs seems to make in Africa. Instead of relying on young, hungry players, a lot of teams choose to sign several experienced players with fading careers. Bukola Babes FC in Nigeria is a great example of a club that did the opposite and won immediate success with inexperienced, young players. What aboout Amadu Banda from Liberty? Is he playing recently,you wrote once that he is player to watch,I had some contact with him but now I see that coach preffers other players on Amadu’s position.